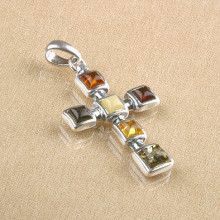 This charming green amber cross pendant would make a great addition to any jewelry collection. 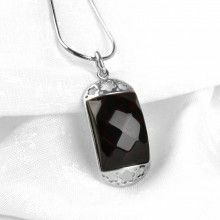 This pendant features one amber stone that has been hand cut into a cross shape and hand polished to perfection. This pendant is both tasteful and classy. The sterling silver setting shimmers and shines in the light. Also, the amber stone is set into a sterling silver border. This allows the backside of the amber to be extraposed so light can shine through the stone.